E-cigarettes — battery operated devices that deliver nicotine in the form of vapor instead of smoke — are now widely available, with more than 250 brands on the market, according to the National Institute on Drug Abuse. Since their introduction to the U.S. in 2006-2007, these devices have become increasingly popular, and millions of people are now “vaping.” Although e-cigarettes have been promoted as a tool to combat the harmful effects of smoking, debate continues as to the pros and cons. Electronic cigarettes do not contain tobacco and do not burn and produce smoke. They contain a liquid, usually within a detachable cartridge, consisting of propylene glycol, flavors, glycerin, and nicotine in many cases. They also contain an atomizer and a battery. The battery powers the atomizer to generate sufficient heat to vaporize the liquid. The vapor, drawn into the lungs, delivers a taste and sensation similar to smoking. E-cigarettes have been shown to be effective in some cases for quitting smoking. In a New Zealand study published in The Lancet, 657 people were randomly assigned either nicotine-containing e-cigarettes, nicotine patches, or placebo e-cigarettes. After 6 months, the highest rate of abstinence was verified for the nicotine e-cigarette users, an even higher rate than those using the nicotine patch. Additionally, e-cigarettes produce far fewer carcinogens than cigarettes. The second-hand effects of vaping are far less harmful to others than second-hand smoke. Until recently, there were no laws against using e-cigarettes in public places, although it is reported on Project Know that ten states and 150 counties across the U.S. now have restrictions in place on the use of e-cigarettes in smoke-free locations. Cigarette smoking is the leading preventable cause of illness and mortality, as reported by the National Institute on Drug Abuse, and e-cigarettes may be a safer alternative to this harmful habit. Most e-cigarettes contain nicotine, which is an addictive drug. According to the institute, the use of e-cigarettes may serve to perpetuate nicotine addiction and actually interfere with smoking cessation. Also, the physical act of smoking is habit-forming in itself. E-cigarettes allow smokers to go through motions similar to those involved in smoking cigarettes, which could also help perpetuate the habit. E-cigarettes do produce some carcinogens, although far fewer than produced by burning tobacco. Vaping products are not subject to FDA approval and may not have been studied closely enough to identify all the potential risks. Ads for e-cigarettes may also be promoting addictive habits to young people. The harmful effects of smoking have been firmly established, and vaping may be an effective method of cessation or at least a less harmful alternative. The jury is still out on whether the pros outweigh the cons. James Caddell is the Editor of dctff.org and author of over 20 books. He is on the board of 3 educational non-profits and enjoys the arts. 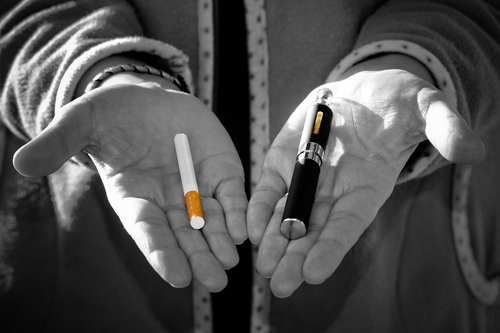 Be the first to comment on "Vaping as a Smoking Cessation Tool: The Pros and Cons"